When the mouse pointer moves over a control or menu item that can display a hint, the OnHint event of the TApplicationEvents component gets executed. The TApplicationEvents component can be used to intercept the events of the global Application object. When ShowHint property is set to true for a status bar, and the mouse is over the status bar, the TApplicationEvents will fire the OnShowHint event – just before the hint is actually displayed. You can use this event to change the appearance and behavior of the hint. Drop a TStatusBar on a Delphi form, leave the default “StatusBar1” control name. Note that it will, by design, align itself to the bottom of the form. Add some panels to the status bar by operating on the Panels property. Drop a TApplicationEvents on the form, leave the default “ApplicationEvents1” name. Make sure ShowHint property for the status bar is set to “true”. 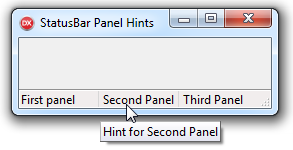 That’s it, now each panel on a status bar displays its own hint! Just wanted to express appreciation and say: Really cool. I always learn something new from your postings. Unfortunately, when your material was transferred to Thought Co. they really messed up the links between your sequential mini-tutorials.